Formuła farby do wykonania imitacji zacieków wodnych na pojazdach w kamuflażu NATO. 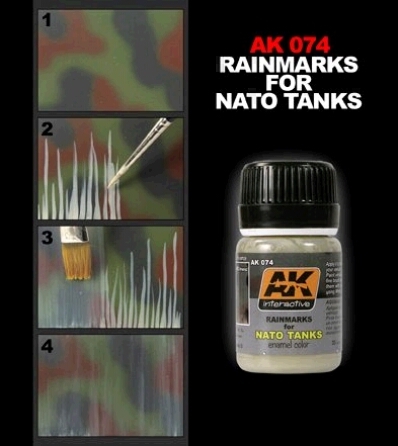 A unique Streaking Grime effect specifically designed for vehicles painted in a tri-color camouflage scheme like those used by NATO but can be used in any vehicle. 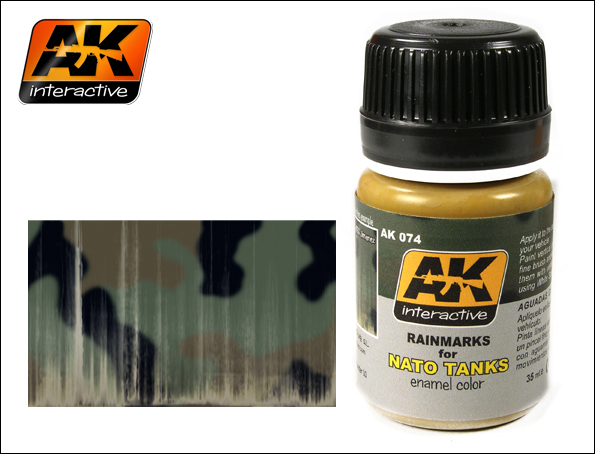 Create realistic streaks and rainmarks with this light colored enamel effect. Shake well before use. Apply your streak with a fine pointed brush in irregular vertical lines from lower parts on sides and let the paint dry for about 10 minutes. 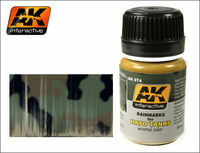 Next take a flat brush moisted in White Spirit and swipe with little pressure over the earlier applied streak to soften the effect and create a natural look.